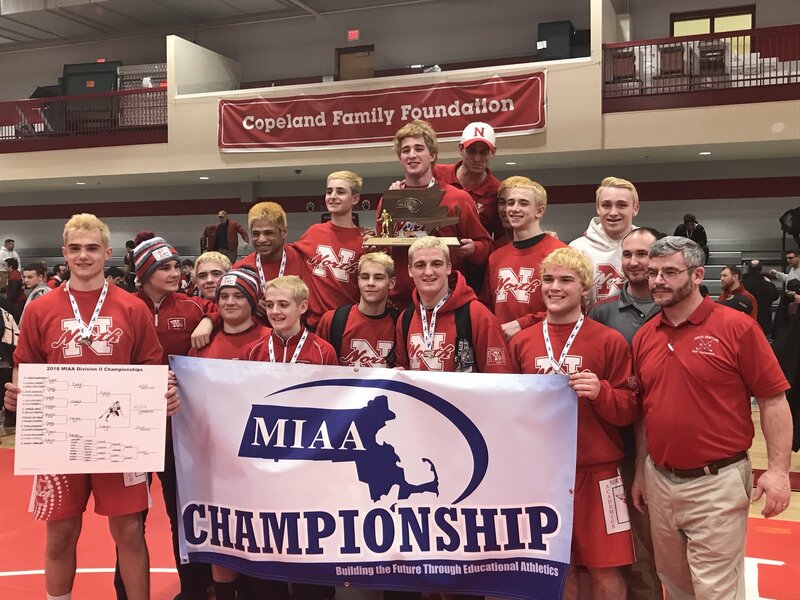 North Attleboro, 55 @ Milford, 18 – Final – North Attleboro recorded six pinfall victories to improve to 14-0 on the reason. Brady Folan (113), Mike Burns (132), Zack Gould (145), Reid Willis (170) and Matteuz Kudra (220) each won via pin for the Rocketeers. Milford’s Dylan Ortiz (126) and Nick Marcolini (138) both won via pin for Milford. FOXBORO, Mass. – Fittingly, the first league dual meet since the divisional split between the top two wrestling programs in the history of the Hockomock and the meet that could eventually decide the Davenport division champion was only decided by the slimmest of margins. Six of Wednesday night’s 14 matches were decided by two points or less. Only two matches were ended in pins with one walk over, two major victories, and a technical fall. In the end, North Attleboro did just enough to pick up the 31-24 road victory at longtime rival Foxboro. With the victory, North put itself in control of its own destiny as it tries to mark its first season in the Davenport by winning the league’s dual meet title. Following the meet, both coaches expressed admiration for their opposition. Starting at 126 pounds, Foxboro jumped out to an early lead. Tom Gallagher picked up a second round pin to open the night, but North cut the lead in half at 132 when Brandon Graveline got a third round takedown of Phil Dure to win that match 6-5 heading into Foxboro’s strongest two wrestlers, Matt and Brian Kelley. The twins, both seniors, added two more wins to their already impressive careers (Matt became the program’s all-time leader in wins, beating out his coach’s record, earlier this season), but neither could get the maximum points. Matt won 13-1 and Brian got five points for his 15-0 tech, but North managed to avoid getting pinned. Gould, fresh off a win at the Marshfield Holiday Tournament last week, got a major win at 152 and cut Foxboro’s lead in the meet to 15-7. That led into arguably the match of the night. North’s Adam Eberle took a blow to the top of his head and had to be extensively bandaged to stop the bleeding, but he managed to pull out a dramatic win against Max Dorman, who also needed attention at one point from the trainer. Eberle fell behind 4-2 with 30 seconds remaining in the match but tied it with a takedown 20 seconds later. He got another takedown early in the overtime period to seal the win. Matt Mullaly got Foxboro going again at 170 with a first round pin and Dave Dow got the winning point on a third round escape to win 4-3 over Reid Wills at 182 to put the Warriors ahead 24-10. From that point on, North would win the final six matches to come out on top. Mateusz Kudra (195), Brad White (220) and John Kummer (285) each pulled in three points for the Rocketeers, as the lightweights got prepared. Foxboro only had Adam Lanctot to wrestle at either 106 or 113, so Ivatts chose to forfeit the match at 106 against Brady Folan, who beat Lanctot in their last match, to try and give his team a shot in the final two matches. Lanctot came back to tie Dan Cooper at 4-4 in the third round after an escape, but Copper answered back with a takedown that turned out to be the winning move in a 6-5 thriller that Griffin said “sealed” the meet. Jake DiRenzo held off Shane Kerrigan, 2-0, at 120 pounds to ensure that North left Foxboro with the victory. When asked what this meant in terms of the league title race, Griffin admitted, “This was the match. No disrespect to anyone else, but this was the match. North Attleboro (9-1) will host a quad meet this weekend, while Foxboro will have a week off before hosting Canton. Franklin, 69 vs. Danvers 29 – Final – Franklin turned a four point lead at the end of the first quarter (11-7) into a big advantage (35-16) at halftime. By the end of the third quarter, the Panthers were up 59-26. Paul Mahon led Franklin with 20 points, Matt Elias added 12 points and Jalen Samuels had nine points. Mansfield, 81 @ Key West (FL), 49 – Final – The Hornets made a splash in their first game in Florida, putting up 50 points in the first half on their way to a big win. Sam Goldberg scored 13 of his game-high 19 points in the opening quarter to pace Mansfield. John McCoy added 11 points and Kristian Conner scored 10 points in the win. Twelve different players scored in Mansfield’s win. North Attleboro, 66 vs. Fitchburg, 51 – Final – Senior Jonny Friberg had another dominating performance as North Attleboro claimed the Lincoln Sudbury Warrior Winter Slam title. Friberg earned tournament MVP honors after scoring 20 points and hauling in 11 rebounds. He averaged 17 points and 14.5 rebounds in the two games. Chad Peterson, who was named to the all-tournament team, scored 18 points and had six rebounds. Senior Brent Doherty also had 18 points and six rebounds. Sharon, 47 vs. Tewksbury, 58 – Final – Ricardo Ripley led the Eagles with 16 points while Malik Lorquet notched his first double-double of the season with 12 points and 14 rebounds. Both Ripley and Lorquet were named to the Wilimington all-tournament team. Stoughton, 67 vs. Boston Latin Academy, 70 – Final – Stoughton junior Cam Andrews tied a career-high with 24 points as the Black Knights fell just short to BLA. Cam Gomes added 16 points for the Black Knights. Attleboro, 68 @ Cranston East, 51 – Final – Attleboro wins the Cranston East Holiday Tournament title. King Philip, 65 vs. Tiverton, 24 – Final – Shannon O’Connor and Sophia McLaughlin, who hit four threes, each scored a team-high 13 points for the Warriors. Julia Leroux added 12 points to help pace the offense. “We shot the ball very well tonight,” KP head coach Marty Crowley said. Warriors advance to face Ponaganset in the tournament final at 6:45 on Thursday night. Mansfield, 40 @ Duxbury, 36 – Final – Mansfield built a double-digit lead, up 33-21, through three quarters and held on in the fourth quarter to win the Duxbury Holiday Tournament final. Jen Peel and Ann Maher each had a team-high 14 points for the Hornets. North Attleboro, 54 vs. Westwood, 46 – Final – Ashley Ahern led the Rocketeers with 17 points. North Attleboro will play host Hingham in the final of the holiday tournament on Friday at 7:30. Oliver Ames, 46 vs. Walpole, 60 – Final – Click here for a recap from the game. Sharon, 52 vs. Holliston, 47 – Final – Sophomore Emma Eberhardt paced Sharon with a team-high 19 points while junior Shira Stoller chipped in with 14 points, 10 rebounds and two blocks as the Eagles picked up their third win. Stoughton, 53 vs. Wellesley, 70 – Final – Freshman Shyanne Trinh scored a team-high 20 points for the Black Knights while junior Val Whalen chipped in with 16 points and six blocks. Canton, 2 vs. Coyle & Cassidy 1 – Final (OT) – Jackson Maffeo opened the scoring for the Bulldogs in the second period but Coyle answered back with only seconds left in the period. The game went to overtime where Bubba McNeice scored two minutes in to seal the victory for Canton in the Gormley Cup at Gallo Arena. The game counts as a 1-1 tie in the overall record. Mansfield, 1 vs. Norwood, 2 – Final – Matt Farragher scored a power play goal in the second period to tie the game but Norwood scored an early third period goal to get the win. North Attleboro, 3 vs. North Smithfield 1 – Final – North Attleboro jumped out to a 2-0 lead in the first period on its way to a win over North Smithfield. Junior Drew Wissler opened the scoring and senior Zach McGowan made it 2-0. North Smithfield cut into the lead late in the first period but Jason McNeany put Big Red ahead 3-1 on an assist from Will Yeomans in the second period. Taunton, 1 @ Stoughton, 1 – Final – Stoughton took a 1-0 lead into the third period off a goal from Sean Doherty but Taunton’s Cam Carnes scored the equalizer in the final period. Lowell Holiday Tournament (Canton, Foxboro, Franklin, Stoughton) – Foxboro’s Matt Kelley had the best finish in the tournament, coming in third at 132. Foxboro’s Brian Kelley (138) was fifth and Matt Mullally (160) was eighth overall. The Warriors finished in 12th overall as a team with 111.5 points. Franklin’s Jordan Carlucci (106) finished fifth and TJ Remillard (126) came in sixth as the Panthers finished 17th with 94.5 points. Canton was 34th with 53 points and Stoughton was 61st with 27 points. Marshfield Tournament (Mansfield, North Attleboro, Oliver Ames, Sharon) – North Attleboro had a pair of winners en route to a fifth place finish as a team with 162.5 points. 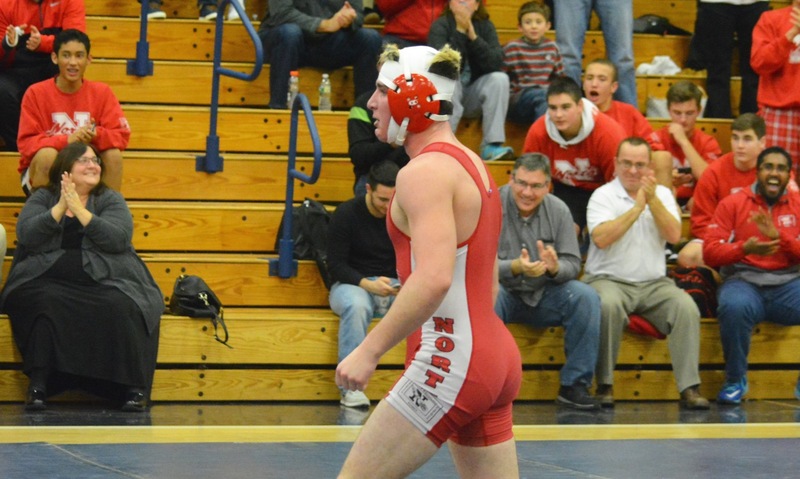 Nick Gould picked up a 6-3 win in the 152 final and Brad White earned a pin in the second period to win at 220. The Rocketeers also got placements from Brady Folan (106), who finished third, Mattuez Kudra (195) and John Kummer (285) each in seventh and Zach Gould (138) in eighth. Mansfield was 14th overall with five wrestlers coming in the top eight. Antonios Sevastos (106) came in second, Vinnie Holmes (170) came in fourth, George Glaropoulos (152) came in fifth and Will Stratton (126) and Jayden Curley (160) each came in seventh. Oliver Ames was 19th with 69 points, led by a second place finish by Liston Funai (132). Eric Berardi (152) and Billy Tat (170) each came in eighth. Sharon’s Yosef Ellis-Rech was fourth in the 126 bracket. Attleboro, 76 vs. Bishop Feehan, 47 – Final – A pair of freshmen made an impact as Attleboro swept the season series against Feehan. Qualeem Charles had 10 points and seven rebounds and Bryant Ciccio had 12 points and five rebounds. Senior Jake Dunkley led the Bombardiers with 19 points and six rebounds. Milford, 69 vs. Tantasqua, 46 – Final – Anthony Arcudi dropped a career-high 22 points to pace the Scarlet Hawks to a win. Zack Tamagni added 13 points while Shane Cosquete finished with nine points. Junior Kayden Kelley scored 10 points and hauled in a career-high 21 rebounds. Milford will face Waltham in the final of the Scarlet Hawks Classic on Thursday at 7 p.m.
King Philip, 59 @ Bridgewater-Raynham, 58 – Final – King Philip overcame a seven point deficit in the first half to take a five point lead by half. The Trojans came back to seize a three point advantage after three quarters. KP was able to build a four point lead late and hold on. Sophomore Kyle Layman had 18 points, eight rebounds and five blocks to lead the Warriors while Justin Vine added 17 points and Will Weir had 12 points. North Attleboro, 57 vs. Reading, 42 – Final – The Rocketeers jumped out to an 18-9 lead after the first quarter and never looked back. Up 33-21, Big Red used another dominate quarter, outscoring the Rockets 17-4 in the third. Junior Chad Peterson led the way with a career-high 15 points while Jonny Friberg added 14 points and Kyle McCarthy finished with 13 points. Oliver Ames, 58 vs. East Boston, 36 – Final – Oliver Ames deployed a zone defense and then pounced with a press in the second quarter to pull away from East Boston. The Tigers outscored East Boston 21-4 in the second quarter and 13-5 in the third quarter. “We used the press and we played zone,” OA head coach Don Byron said. “We got pretty active – tops on that list was probably Welch, he gets his hands on a lot of stuff in the zone. We ran out on that pretty well and we were able to compound things a little bit by jumping into the press once we scored.” Jack Spillane led OA with 12 points and 11 rebounds, Dylan Mahoney had 12 points and five rebounds and Matt Muir finished with 10 points and five rebounds. Sharon, 52 vs. Arlington Catholic, 33 – Final – Senior Ricardo Ripley scored all of his team-high 14 points in the second half to lead Sharon to the win on the road at Wilmington. The Eagles only allowed 13 points in the second half and won the fourth quarter 17-6. Jimmy Fitzhenry also had 14 points in the win while Jayvon Monteiro scored 11 points. Taunton, 73 vs. Hope (RI), 49 – Final – Freshman Naz Kenian scored a career-high 16 points as Taunton rolled past Hope. Junior Malik Charles chipped in with 14 points for the Tigers. Attleboro, 60 vs. Cranston West 35 – Final – Sarah Deyo led the way for the Bombardiers with 18 points and 14 rebounds. Julia Strachan, Sam Pierce, and Jordyn Lako each added 10 points for Attleboro. Mansfield, 52 vs. Marshfield, 47 – Final – Jen Peel had 18 points and five assists to pace the Hornets. Meg Hill added 12 points, 12 rebounds, and eight blocks and Ann Maher had 10 points for Mansfield. The Hornets will play Duxbury in the final of the Holiday Tournament on Wednesday at 5:45 p.m.
Milford, 60 @ Hudson, 31 – Final – Kate Irwin was the top scorer for the Hawks with 23 points and Jess Tomaso chipped in with eight points. Oliver Ames, 48 vs. Needham, 42 – Final – Oliver Ames rallied from a halftime deficit to tie the game but the Rockets reestablished a lead (31-26) at the end of the third. The Tigers seized the lead early in the fourth quarter and held on. Kayla Raymond led the Tigers with 18 points while Niyera Mitchell had nine points and a career-high 19 rebounds. The Tigers will host Walpole in the final of the Sure Rivard Tournament. Lowell Holiday Tournament (Canton, Foxboro, Franklin, Stoughton) – After the first day, Foxboro is in eighth place with 79 points and Franklin is in 11th with 69.5 points. Wrestlers that made the quarterfinals include Foxboro’s Adam Lanctot (106), Canton’s Justin Dickie (113), Franklin’s TJ Remillard and Foxboro’s Phil Dure (126) and Foxboro’s Matt Kelley (132). Marshfield Tournament (Mansfield, North Attleboro, Oliver Ames, Sharon) – North Attleboro is in third place with 111.5 points with 10 wrestlers moving onto day two. Mansfield is just outside the top 10 with 66.5 points (13th place) with six wrestlers moving on. Wrestlers that advanced to the semifinals include North Attleboro’s Brady Folan and Mansfield’s Antonios Sevastos (106), Sharon’s Yosef Ellis-Rech (126), Oliver Ames’ Liston Funai (132), Mansfield’s George Glaropoulos and North Attleboro’s Nick Gould (152), Mansfield’s Vinnie Holmes (170) and North Attleboro’s Brad White (220). Canton, 2 vs. Dedham, 0 – Final – Sophomores Lauren Fitzpatrick and Maggie Malloy each netted a goal in the third period to lift the Bulldogs. Junior goalie Colleen Kelleher made 24 saves for her second shutout of the season.